I have abandoned all healthy eating. My shorts are a little tight again. Swimsuits are put away for the season. What? Is it too early for that? These chips are awesome. Even Michael said after he ate them, “you made these?? ?” Ye of little faith. Why yes, I made those. I made a small batch of them too so that I don’t over eat, so back off the BBQ chips buddy. Remember, YOU were the one who wanted to eat healthy! Go have an egg white. The rest of the chips are mine! BBQ chips are my favorite type of chip. So when I saw a recipe for these on Taste of Home I knew I had to make them. Except, I made them my way. I used my secret ingredient. Wait for it…..
Bacon Salt. Yes. It’s a beautiful thing. You can find it at most grocery stores in the seasoning aisle, near the Lawry’s and Mrs.Dash. Find it. Then make these chips. Unless you’re on a diet. Then I don’t want to be to blame. Mix seasonings in bowl until completely combined. Set aside. Heat oil in skillet. Fry potato slices in batches for several minutes per side, until browned. Remove from oil with slotted spoon. Drain on paper towels and immediately sprinkle with BBQ seasoning. Store in airtight container. looks awesome! i have to try these. where do you get bacon salt? What a treat!!! They look perfect! I just get the Bacon salt at our local grocery store chain. It’s in the seasoning aisle right near the Lawry’s and Mrs.Dash. It comes in different versions, I just buy original. Lark- french fries would be great with this!!! I’m enjoying your recipes and your writing Aimee. You’re a very good writer. 🙂 I giggle nearly every time. Have a great weekend! Yum! Your chips look great! 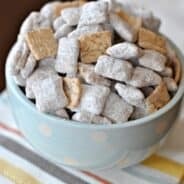 I haven’t made them in a long time and this inspires me to try yours! Kristy- thank you! I hope you are having a great weekend too! I can see why you like these. These are savory chips to the max. oh if i made these there’s not way I could resist – total nono on a when low carbing it…I’ll save this recipe for the beach when all diet bets are OFF! Yummy! BBQ chips are my favorite. I have never made my own chips before but I definitely should start. Coming over from Melt in Your Mouth Mondays. If I am going to eat potato chips, barbecue flavor is what I want, too. I am going to have to try this. Looking for the bacon salt on my next shopping trip. Oh my goodness, these look awesome! I love BBQ-flavored snacks!! Those look and sound amazing!! I might have to try making my own potato chips but I’m going to make mine the salt & pepper kind. Love that stuff! Mmmm! Bacon salt? Who knew? Soooo… I love barbeque chips. This could be dangerous. Great recipe! And photo! visiting from tempt my tummy! 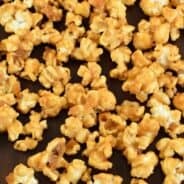 the july giftaway is on! hope you’ll enter!! Yum! This looks good. Can you believe it’s already going to Wednesday again? I am here to invite you to “Cast Party Wednesday”. 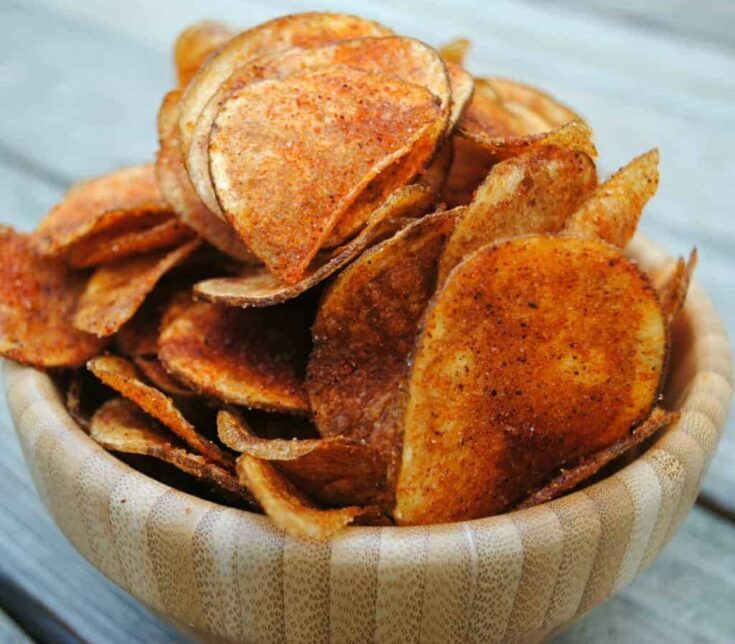 I love homemade potato chips…and homemade bbq seasoning?! Over-the-top! YUM! What a great idea. I’m going to have to try these! I at a tonne of homemade chips when I was pregnant but I have not tried bacon salt! How has this passed me by? Those looks so yummy and dangerous! Wonderful. Check out pesto brushetta today. Come on over and visit us. These are incredible!! We are so impressed that you made these yourself!! We just wanted to stop by and thank you for linking up to our first link party last week. We appreciate your support so much! We would love to have you stop by again this week and link up more of your great things at Strut Your Stuff Saturday! there are very few things i like more than bbq potato chips. i never thought to make them myself…but as soon as i find that bacon salt a bucket of fat is going in my fry pot. thank you for sharing with tuesday night supper club. How did I miss these chips before? They look awesome and I’m featuring them Wednesday! It’s Serendipity — my daughter just tossed a bottle of Bacon Salt in to our shopping cart last week. I can’t wait to try these! Jenn- you won’t regret it!! What a lovely indulgence, I’m sure the seasoning was heavenly! These look fabulous! BBQ chips are one of my favorite things. 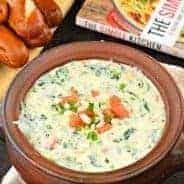 I shared your recipe on my Must Try Tuesday blog post. “Store in an airtight container.” Yeah, like THAT’s gonna happen! Those look delicious! Perfect naughty treat. I love me some BBQ chips, like I could eat a whole bag of lays bbq chips if I would let myself! These sound great! What if you don’t have bacon salt, what do you use instead? I saw this over at This Chick Cooks and just had to come check it out!! Those are some pretty chips Aimee! They look delicious. 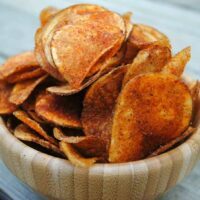 You know it’s interesting that I found this recipe today as I love BBQ chips and I was wondering if you could make them at home. If there’s one thing I can’t resist it’s barbecue potato chips. I have tons of discipline when it comes to desserts but if there are barbecue potato chips in the house, I am always aware of their presence and my resistance slowly wears down. This recipe look amazing! I would rather splurge on these than cake or cookies or anything. I’m definitely going to make these!